CSR Initiatives | NIHON MATERIAL Co.,Ltd. As a precious metals refinery of gold, silver, platinum and palladium, Nihon Material Corporation recognizes its mission to contribute to society through the efficient and safe reuse and recycling of finite resources. In order to accomplish this mission, it is vital that we not only pay attention to the environmental impacts of our business but also provide safe and healthy work environment to our employees and maintain good relationships with our stakeholders. We promote CSR initiatives in line with our CSR Policy, Environmental Policy, Health & Safety Policy and Responsible Sourcing Policy, for us to continue to be a company that is trusted by stakeholders and needed by society. We will provide useful, quality products that contribute to sustainable development. We will not only act sensibly and observe rules and regulations in and outside of Japan, but also will conduct initiatives to help solve societal issues in cooperation with governments and local communities. We will seriously consider Earth’s environment and make utmost efforts to preserve it. We will prevent any workplace discrimination based on gender and other factors and maintain safe and healthy work environment so that every one of our employees with different backgrounds and characteristics can maximize his or her ability. We will not offer or accept money or other forms of recompense in order to gain or give unfair benefit. We will not have any relation with anti-social organizations or their affiliates. We will strive to maintain decent working conditions and will not, directly or indirectly, be involved in any forms of illegal labor (e.g. child/forced labor) and human rights abuses. We will publish our CSR performance data on our website that have gone through our internal verification process in order to increase the transparency of our CSR initiatives. We promote initiatives such as energy/resource saving activities in line with our Environmental Policy. As a precious metal refinery of gold, silver, platinum and palladium, Nihon Material Corporation will prevent pollution through continuous improvements to our operation, setting environmental goals shown below. We will identify environmental aspects of our operation and strive to prevent pollution. We will also keep improving our environmental management system by setting environmental targets and goals. We will observe environment-related regulations, ordinances and treaties. We will also set our own standards as necessary and fulfill requests by customers and other stakeholders we agree to comply with concerning environment protection. We will consider how our business activities (refining, fabrication, assay and sales of precious metals), products and services would cause impact on the environment and promote environment conservation activities emphasizing the followings. We will maintain and further improve our environmental management system and enhance environment conservation activities through an internal environmental audit. We will document and publish our environmental policy to make it available to the public. Through employee training and public relations activities, we will make all our employees be aware of the policy and ensure that we are all highly conscious of protecting environment. 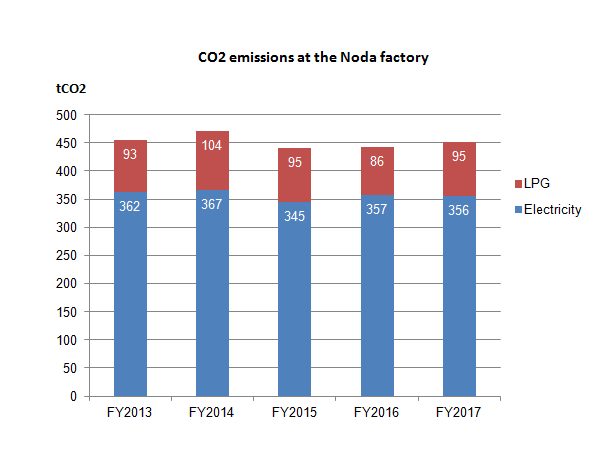 We, at our ISO14001 certified Noda plant, are undertaking initiatives to reduce energy use and associated CO2 emissions and minimize resources use. 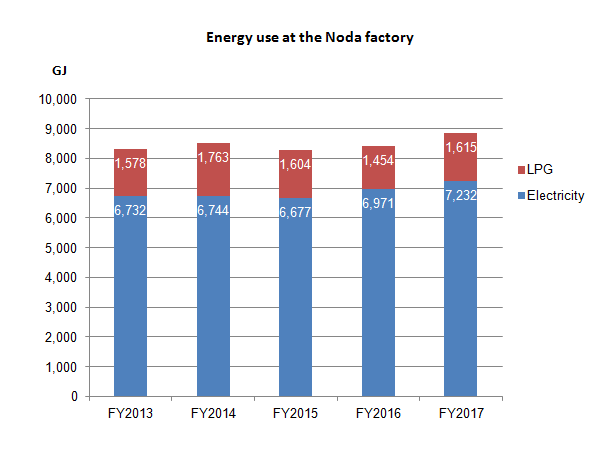 Our energy use has almost been stable in the past five years, although there are some changes due to fluctuations in production volume. Our CO2 emission is also same tendency. We also undertake water saving measures, and water use in 2017 is lower than peak in 2015. ※The calculation is based on the Act on Promotion of Global Warming Countermeasures. We routinely monitor compliance with applicable environmental and health & safety laws and regulations within our environmental management system. The final evaluation of compliance is performed during the management review process each year. We did not identify any major violation of laws/regulations in fiscal 2017 that was subject to administrative guidance or adverse disposition from the government. We promote initiatives in line with our Health & Safety Policy. We will increase the physical and mental well-being of our employees, giving the highest priority to their health and safety. We will continually improve safety performance by identifying hazards and preventing occupational accidents and diseases. We will observe applicable health and safety-related laws and regulations and other relevant requirements. We will communicate to our employees this Health & Safety Policy and the roles they should play in relation to health and safety, thereby increasing awareness of safety. 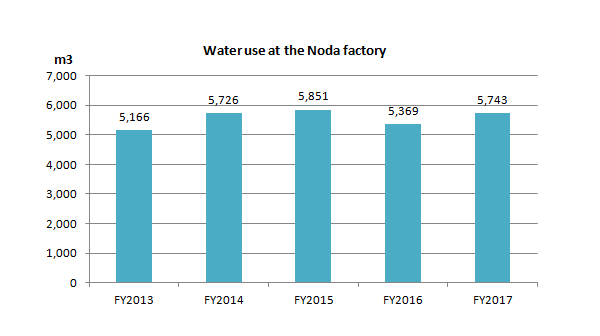 The table below shows the number of lost-time work accidents at the Noda factory in the past five years. We understand that our main stakeholders include our employees, business partners, customers, and governments/local communities. We will gain the confidence of these stakeholders and contribute to the realization of a better society, by identifying and responding to issues through interactions with each of these stakeholders. Employees We will prevent any workplace discrimination based on gender and other factors and maintain safe and healthy work environment so that every one of our employees with different backgrounds and characteristics can maximize his or her ability. Business partners We pursue fair and free transactions. We undertake measures in order to avoid contributing to conflict and human rights abuses in the procurement of precious metals materials, and to prevent anti-money laundering and terrorist financing. Customers We will provide useful, quality products that contribute to sustainable development. Governments / local communities We will not only act sensibly and observe rules and regulations in and outside of Japan, but also will conduct initiatives to help solve societal issues in cooperation with governments and local communities. We undertake measures in order to avoid contributing to conflict and human rights abuses in the procurement of precious metals materials, and to prevent anti-money laundering and terrorist financing. For more details, please refer to our Responsible Precious Materials Management Policy and our LBMA Responsible Gold Guidance Compliance Report that has been submitted to the London Bullion Market Association.